Tuesday evening found us in a little anchorage between Frazier’s Hog Cay and Bird Cay in the Berry’s. It took us until 6 pm to drop anchor there, having spent 11 hours at sail to make around 38 miles. This slogging and beating into the wind is starting to drive me crazy. The day that we get down to Georgetown or Long Island will be a day of joy, because at that point we’ll be turning around to head back to Miami, and should have the wind at our back, or at least on our sides, the rest of the way back. No more getting stuck for days at a time while waiting for the wind to shift off you nose. Why go back to Miami you might ask? I can’t remember if I’ve mentioned it yet or not. Miami is going to be our new jumping off point to cross the Atlantic. It was originally going to be St. Martin, but our extended stays in Isla Mujeres and Ft. Lauderdale left us without the time to get ourselves all the way down there by mid-May to prepare ourselves for a June departure. Unless we wanted to skip everything along the way. Then it was going to be from either Georgetown Exumas or Calabash Bay in Long Island, but while taking Georgie to the vet in Ft. Lauderdale for her rabies titer test, something that’s required to get her pet passport which will allow her into Europe, we were kicked in the butts with a nice little surprise. After her titer test came back, four to six weeks later, she needed to be checked out by the USDA before finally having her paperwork stamped that she was rabies free, healthy, and free to enter any EU nation. Well, by the time her results actually came back and she would be allowed to see the USDA, we’d already be long gone for the Bahamas. So now, we go back. It’s not to bad actually. We’re having to hurry a little bit more than we anticipated, but we both think it will be good to do last minute preparations and provisioning in the states. Everything we need to get will be much easier to get in the states than in the Bahamas. I’m sure it’s not going to be until the week before we leave that we think to ourselves ‘Oh crap, we need to get x, y and z, and they can only be ordered online. Time for Amazon prime!!!’. Since that’s kind of how it worked even when we were just leaving for the Bahamas. 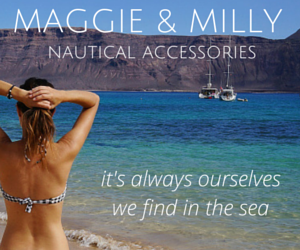 You’d think that we’re prepping ourselves for two months at sea, or headed to a developing country, none of those being the case, but it’s now our minds work. ‘I want/need this. I can get it here. I should do that’. So those are our near future plans. 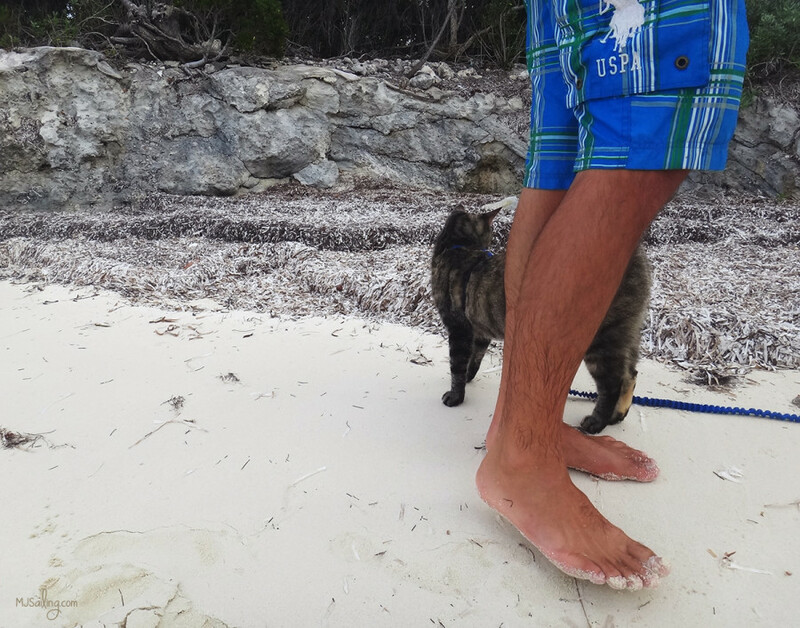 But for the moment, we’ve still been trying to slowly make our way to our friends in the Exumas. Yesterday was spent in the anchorage, waiting out SE winds that of course shifted north by 11 am. 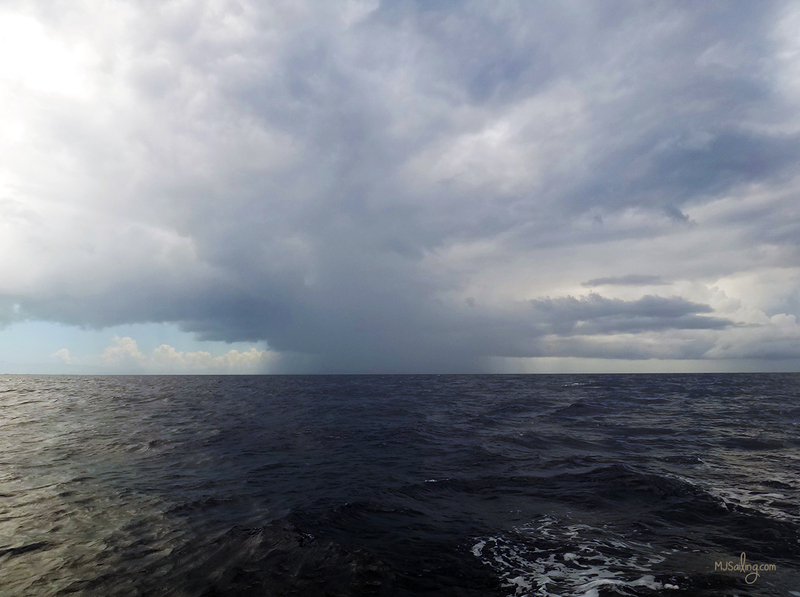 What would have been perfect sailing conditions for us to get to Nassau. So we made the most of the day and took Georgie on another shore leave. 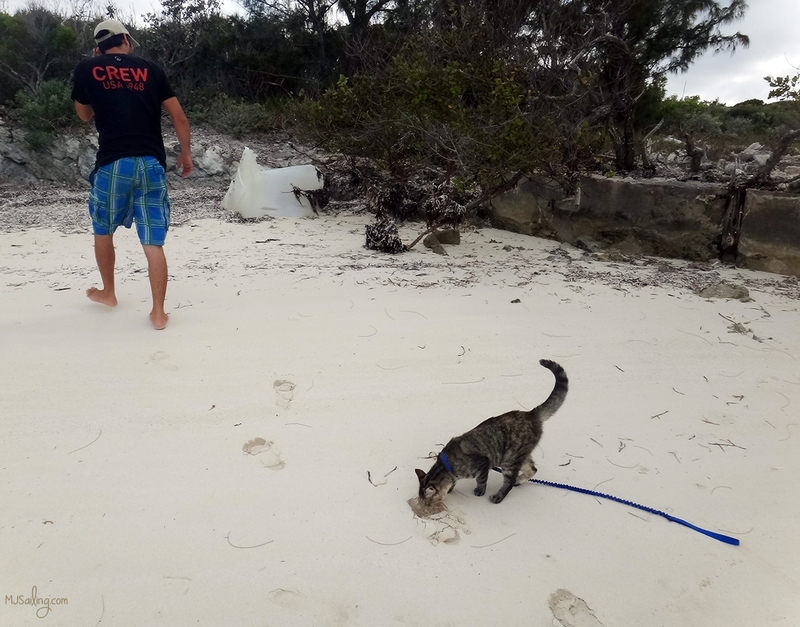 Just a little bit different than the Florida Keys, she was much more content to stick right by our side for the first 20 minutes until her interest got the better of her and she began running away. Right into a thicket where I had to hunt her down and pull her out…in my bare feet. Which, when I put her down for two seconds so I could pull thorns out of my heel, she ran right back into them. We made sure to keep a tight grasp on her leash after that. Today we made, ugh, another slog from the Berry’s to Nassau. Only 10 hours for that 35 mile haul. After a few hours of motoring the wind actually shifted enough that we were able to turn off the engine and motor sail alone. Just as I was thinking that things were finally going our way and had gone below for a late morning nap, Matt woke me up 45 minutes later to let me know a storm was coming and we had to pull in the geneoa. Which took away all of our speed and our pointing capabilities. All of a sudden we were back to pointing straight down to Andros. 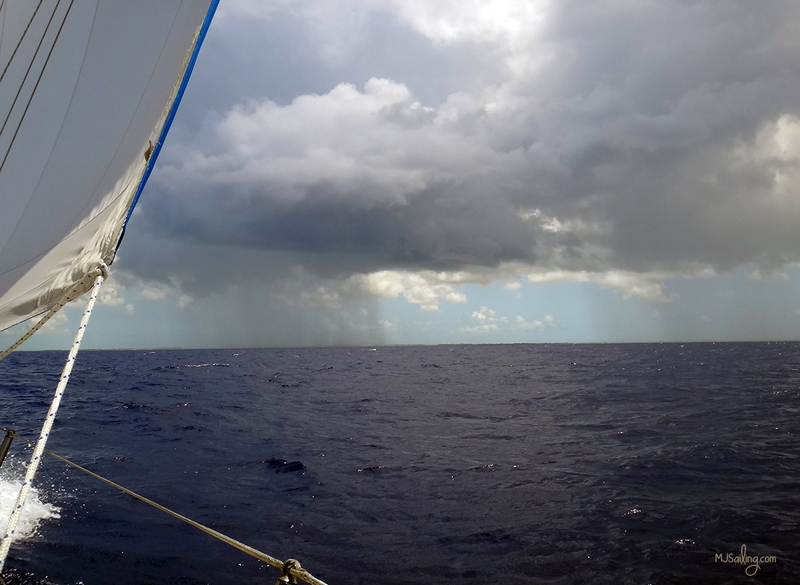 An hour later it passed and we were able to get the headsail back out again, but for the rest of the afternoon we watched storms off to our left and right and prayed they wouldn’t come any closer to us. Three of them off our starboard side seemed to collide with each other just behind us and form one mega cloud of nastiness that I am so thankful we were not caught anywhere near. We pulled into the bustling harbor around 5:30 and at that point, it could have rained all night if it wanted to. I just wanted to get our anchor down before it happened. 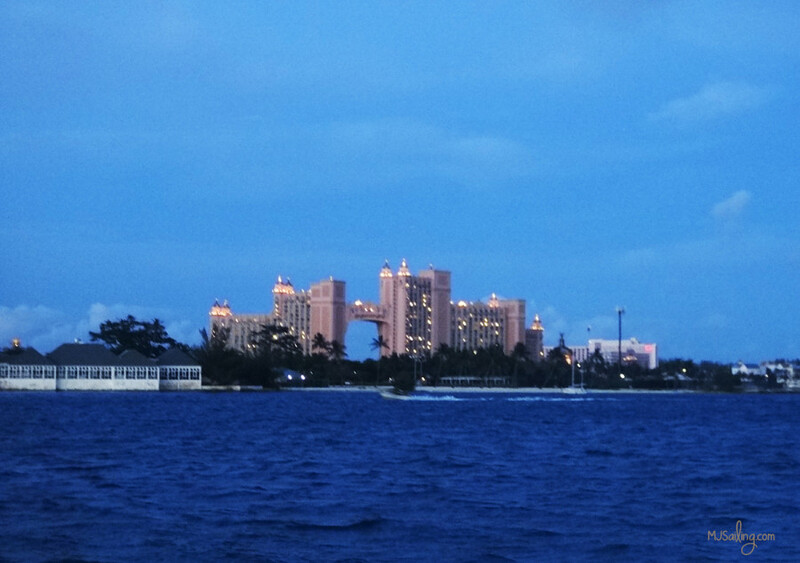 Once more we were surrounded by cruise ships and the glittering lights of Atlantis in the distance. Visiting the first island that we’d already been to last year, we’ve now come full circle. Now if only we can get out of here ASAP and check out some of the islands we flew past last year. 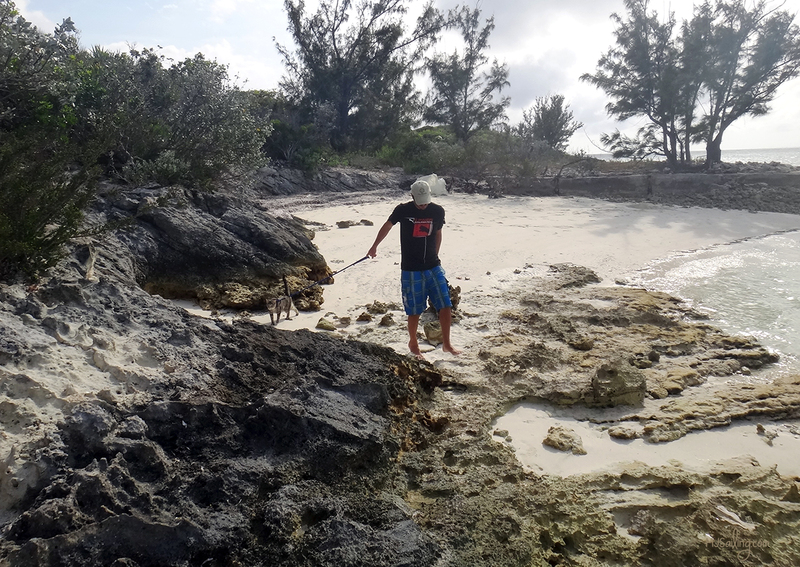 The sunken piano on Musha Cay, Boo Boo Hill on Warderick Wells, Duffy’s at Norman’s Cay. I’ve already got my list going. 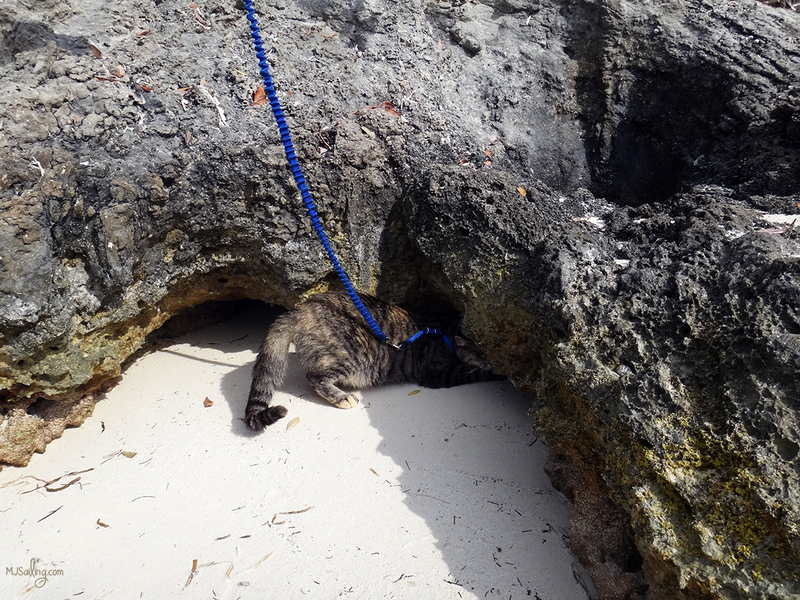 This entry was posted in Bahamas, Passage Making and tagged Berry Islands, boat cat, Nassau, storms. Bookmark the permalink.